Lamborghini has started the celebration of its 50th anniversary in pure style, launching the new Aventador LP700-4 Roadster with a spectacular show. 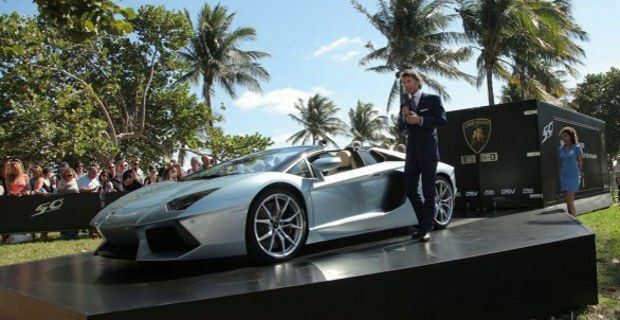 It took place in South Beach Miami, Florida, where the luxury Italian manufacturer has organised a very special event, which included a sumptuous parade of hypercars followed by a conference held by Lamborghini CEO Stephan Winkelmann. The parade saw the participation of 40 cars including 12 Lamborghini Aventador Roadster, 5 of which were LP700-4 Roadster, racing each other on the runway of Miami International Airport. The carmaker received a special authorisation to realise this spectacular event and it was the first time that a vehicle has exceeded the 290 km / h limit, which is the takeoff speed of most planes on this track. The Aventador has been able to reach a mind-blowing 338 km / h on the runway. An American Airlines Boeing 777 is also featuring in the pictures taken at the iconic event, to represent the recent collaboration between Lamborghini and Boeing. Lamborghini will stay in Miami for 10 days, during which will celebrate its 50th anniversary together with the media, dealers and the public. The new Lamborghini Aventador LP700-4 Roadster is the drop-top version of the current flagship model of the manufacturer. The hyper-car has an incredible power output of 700 HP, and it's propelled by a 6.5-litre V12 engine. Acceleration from 0 to 100 km / h is covered in just three seconds with a top speed of 350 km / h. The removable roof top is made of carbon fibre and includes only two pieces, each weighing less than 100 kg.